Kelkay Ltd, which was bought by US public company, Griffon Corporation earlier this year, has announced the acquisition of the Doncaster-based outdoor wooden furniture and garden structures manufacturer, Anchor Fast. The deal marks another step in the development of Griffon Corp’s subsidiary, AMES UK, of which chimenea and firepit supplier La Hacienda is also a part after it was bought last July. Anchor Fast has a 34,000sq ft manufacturing facility in Doncaster and employs more than 20 people. The business is dedicated to crafting its range of FSC-certified products for both retail and commercial markets. Anchor Fast and Kelkay are based close to each other – with around 18 miles between them - which will help support the business integration plan. The intention is to distribute Kelkay and Anchor Fast products together, as soon as this can be practically arranged, said the company. The move means that retail customers will, in turn, be able to combine their aggregate, paving, water feature and wooden outdoor product requirements into one order. 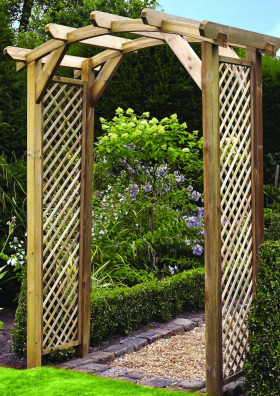 Mr Harker continued: “We plan to bring the Kelkay garden centre service approach to the sales, marketing and distribution of the wooden products category. A key attraction was the high level of manufacturing experience and design expertise in the team at Anchor Fast, all of who will be remaining with the business. The company confirmed that ongoing orders will remain unaffected and Kelkay has advised that, until further notice, orders can continue be placed with Anchor Fast as normal or by contacting your Kelkay representative.